This week, the Thirsty Thursday posting had to be postponed due to having a cooking class that night. Little did I know that after the class, I would be thirstier than I ever imagined possible! Thursday brought one of the hottest days in Cleveland in several years. When I arrived at the cooking class, I was stunned to find out that they did not have air conditioning!!! And we would be using the oven. AND we were boiling pasta! It was like your worst sauna nightmare come to life in a kitchen. Thankfully, I had mixed up my Thirsty Thursday special before I left for the class. This week, I kept it really simple and made one of my all time favorites - Cucumber Water. But I added a new twist - mint! I first tasted cucumber water when some friends and I went to Chicago last year for my birthday. We stayed at the elegant and gorgeous Palmer House. My roommate and I opted for the upgrade to one of the luxury executive suites. It was amazing and totally worth it! In addition to having our own bathrooms and walk-in closets, we also had 24 hour access to the Executive Lounge. This delightful bonus consists of complimentary breakfast, hors d'oeuvres, snacks and beverages. Our favorite beverage was cucumber water - a refreshing and thirst quenching infusion. I loved it so much that after returning home that at my next dinner party I made a batch for my friends. I was wondering if they would enjoy it as much as I did. Thankfully I made it in a huge beverage dispenser because they all loved it. Now it's a staple at ALL our parties! Because I have an explosion of mint growing in my yard, I've been experimenting with adding it to just about everything. I decided to add it to my beloved cucumber water and it really added an extra layer of freshness. My favorite is having a fresh sprig in my glass so I can smell the sweet mint as I take a sip. Fabulously refreshing! 4. Let steep for several hours or overnight. TIPS: Make sure your cuke doesn't have a waxed skin on it - if it does, peel it. I added a intact mint stem in addition to the leaves - just because it looks so pretty! You can refill the same pitcher several times without changing the cucumbers. Be sure to add a sprig of mint to each glass when serving. Last weekend my friends and I went to Little Italy. It was a perfect summer evening and we were looking forward to walking around and soaking up the sunshine and ambience of this favorite ethnic enclave. We started our evening with some pasta and vino at Gusto. It was my first time there and I was looking forward to checking it out. We were surprised at how empty it was especially for a Saturday night. It did get busier as the night progressed but was never at full capacity. We ordered wine and bruschetta. The bruschetta sounded amazing - grilled Ciabatta with smoked mozzarella, grilled asparagus and prosciutto drizzled with white truffle oil. When it arrived we were EXTREMELY disappointed because it consisted of two slices of bread, four slivers of prosciutto, and one stalk of asparagus...for $11! Thankfully it tasted good but we all considered it one of the biggest rip offs ever. We each ordered different pastas so we could taste an assortment of flavors while we were there. I ordered Fettucini with wild boar meat sauce with Parmigiano Reggiano because I had read about it in several online reviews. We also had cavatelli with butternut squash in a sage butter sauce and gnocchi with a green olive caper pesto. Everything was fabulous! The pesto was unusual but the flavors were a nice contrast to the gnocchi. The portion sizes varied with the cavatelli being the largest and my linguine being the smallest. Mine was so good I literally wanted to lick the sauce off the plate...probably because I hardly had received any food! : ) Our overall impression was that the food was very good but the prices were out of line. There are places with equally flavorful food that are a better value. We then walked around and took a peak at a bocci tournament that was being played at Alta House. We also stopped at the Murray Hill Market which is a great little neighborhood grocery store. They have a surprisingly good assortment of canned and fresh foods including Jeni's ice cream. They also sell homemade prepared foods. We'll have to go back for some of the porcetta! Next we decided to head over to Washington Place Bistro. This is the new spot at the former Baricelli Inn. A table opened up on the patio and we grabbed it. We were disappointed that there was not a Baricelli cheese plate on the menu. We were informed that they use the cheeses in the dishes but do not sell them separately. Due to the constant requests for it, they are considering adding it to the menu. We were looking for something small and light. There were so many fabulous sounding choices on the menu that we had a hard time chosing. We finally decided to split the Field Greens Salad at our waitresses' suggestion: great lakes growers hydroponic greens, shaved fennel, dried cherries, navel orange, sunflower seeds, citrus vinaigrette. It was a refreshing choice and the perfect size to split with a friend. After looking at their menu, we decided that we are definitely coming back here for dinner - and soon! Everything on the menu sounds like heaven and the prices make this a great value. They also have a special 2 for $40 menu on Wednesdays that make this a must do! For $40, you share an appetizer, enjoy 2 entrees and get a bottle of wine! Corbo's had a choice between plain or chocolate dipped shells and we went for the chocolate. Presti's only offered plain shells. We figured that while this wasn't truly and "apples to apples" comparison, we would still be able to pick a winner. 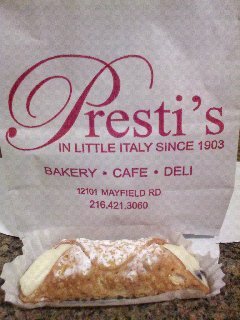 Presti's cannoli is pre-filled and did not look as appetizing. We we worried that it would be soggy. Corbo's looked better out of the box. I think the chocolate dipping really helped the presentation. Presti's filling has a hint of lemon. It added an unexpected element of brightness. And the shell held up well in spite of the pre-fill. Corbo's filling is creamy, lightly sweet and has mini chocolate chips in it. This went well with the chocolate dipped shell. The shell was crisp and light. 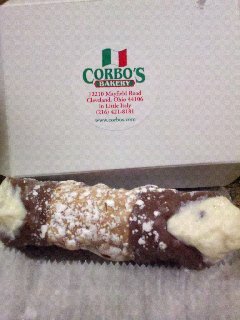 When I had the first bite of the Presti's cannoli, I initially thought it was a poor relative of the Corbo's version. Additional tastings of the filling on it's own made me appreciate the slight tang of the lemon. My final conclusion is that it is a really tasty, just different, version that I would definitely recommend, especially for those who do not like or are allergic to chocolate. 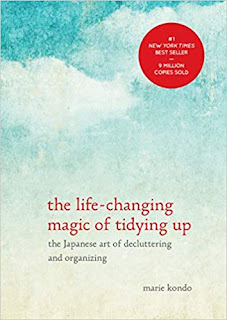 The Corbo's version is still my favorite. Their filling is much creamier and the flavor is outstanding. The chocolate chips are a welcome addition, especially when ordering the chocolate dipped shells. In conclusion,either one would be a tasty ending to a wonderful meal in Little Italy. I recommend having a taste off of your own. Buon appetito! Join us for a journey to the rural retreat of Geauga County, for a most authentic “Farm to Table” gathering. Our first annual “Return to Earth Dinner” will be held just a stone’s throw away from the hustle and bustle of the city, and will showcase the culinary harvest of beekeeper’s daughter, Chef Kimberly McCune, Owner/Chef of Vine & Dine. This quintessential “Pasture to Plate” dinner party will feature Chef McCune’s creations from 100% local food, sourced within 50 miles of the pastural countryside setting of Meadowlane Farms <http://www.meadowlanefarms.cc>. Designed with the foodie in mind, ReHival™ will present a new modern twist on family style dining, and the debut McCune’s own ReHive Ale, a local brew crafted by Little Mountain Brewery in Mentor, Ohio. McCune’s Allstar Culinary Team will showcase the talents of Lanny Chin of Bon Appetit, Jimmy Gibson of Case Western Reserve University, Amy Ryan of Viking and Scott Roitblat of Vine & Dine. Dress: Country casual. Throw on your best blue jeans and boots if you got 'em. I want to introduce myself. I am the pampered pooch of Eat*Drink*Cleveland. My name is Buffy. I really don't slay vampires - I much prefer squirrels. I love it when I get leftovers from my Mom's awesome food adventures. I'm known for my smile and my circus tricks. Today I'm here to share my very own culinary "tale" with you for a special canine guest blog. Saturday was a gorgeous summer morning and my person left me home alone. I was sad and forlorn until I discovered the reason for her abandonment. TREATS! Well if any of you know me, you know I LOVE treats! They are my favorite thing in the world, and if the people would let me live off them, I would. I wanted to dig right in but my Mommy wanted to tell me a story about another little dog. Like I care - the world revolves around ME you know and don't forget, treats were waiting! But I indulged the human because they seem to like to talk an awful lot and sometimes I actually listen. Holzheimer that loved her dear little dog so much she made HOMEMADE treats. What?!?! I see where I rank. I never get those! Anyways, I digress. This other little dog's name was Pudding. They found her when somebody pushed her out of a car and left her in the street. Andrea rescued Pudding and loved her very much for many years. Pudding was a sweet Shih-Tzu that smiled all the time. We must be distant cousins because I'm Shih-Tzu and Maltese and I smile too! One day poor little Pudding became sick so that is when her Mommy decided that she wanted to feed her something special to try to make her feel better. The treats were so good, she decided to share them with other dogs and Sun of a Biscuit was born. Pudding eventually got so sick that she went to Doggie Heaven in April of 2011. Her memory lives on through Sun of a Biscuit. Andrea now bakes up tasty wholesome treats and donates a portion of the proceeds to animal shelters in honor of her special furry friend. The story is very sweet and very sad. I'm glad I listened. I wish I would have known Pudding. We might have been friends. But back to the treats! My Mommy knew that I would just love the pretty pink cone of treats she selected. See how it matches my pink princess bed? It was packaged very nicely (perfect for gift giving) in paw printed wrapping and bow. The flavor was Banana Peanut Butter Bliss - my tail started wagging just at the sound of it! Can't wait to take a bite! When the package was opened, the spicy scent of cinnamon filled my twitching nose. It smelled like an oatmeal cookie. This is when I finally got a good look at the treats. They were a perfect size for my salivating mouth AND they were heart shaped! After being forced to pose for pictures, I finally got to take my first bite. WOW! These things are bow wow fabulous! I gobbled the treat down in record time. It was very crunchy and big enough that I actually had to chew it. My Mommy says this helps clean my teeth. I think that's a better idea than brushing them - I really hate that! She also says that they are really good for me. They are made of people food especially for spoiled dogs like me. This flavor contains rolled oats, whole wheat flour, peanut butter, bananas, apples, carrots, extra virgin olive oil, blackstrap molasses and cinnamon. That's it! No salt, sugar or preservatives - just the way we like it. My Mommy said that they smelled good enough to eat. No way - paws off! These are all mine! Dear Santa, more Bonz please! You can get your favorite pooch some at Whole Foods or look for Andrea at the North Union Farmer's Market at Shaker Square on Saturday mornings (she's not there every week to check before you go.) You are definitely going to want to get some. Buffy says, "TWO PAWS UP! 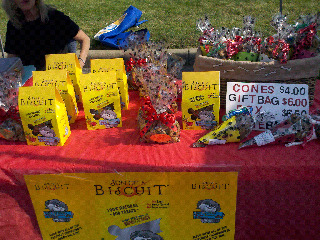 These treats rock!" I know exactly what I'm going to be asking Santa for this year. I want to bark out a special thanks to my Mom for getting me such great treats and letting me do a doggie guest blog. Also, thank you Andrea and Pudding for helping make the world a tastier place for dogs everywhere. I hope other dogs out there are as lucky as me and Pudding! You can find Sun of a Biscuit on Facebook now too. The inspiration for my first Thirsty Thursday posting in honor of my fabulous Kufra pitcher from Bormioli Rocco (yes! made in ITALY instead of the usual China - bonus!) came to me at dinner earlier this week. My Auntie and I went to one of our favorite restaurants in Chagrin Falls,Umami. It's a teeny but stylish spot right on Main Street that specializes in food with a Asian flair. It was bustling on a gorgeous Tuesday night. Dearest retired Auntie arrived first and was already enjoying a jasmine iced tea with a ginger infused simple syrup. Refreshing and delicious but a little too sweet for me since I never sweeten my tea. The waitress offered a basil lemonade and that immediately caught my attention. It did not disappoint. I macerated the fresh basil that was served in the glass and found it to be absolutely perfectly refreshing. The basil was an unexpected but very complimentary element - delicious! I decided to try the easiest route when making my version to see if it could truly be that simple. I found out, not surpisingly, it is not. I used Minute Maid frozen lemonade concentrate, filtered water and basil out of my herb pot. While it was tasty, it does not have the sublime basil flavor of Umami's lemonade. Some tweaking is in order. Next time, I will still try to stay with the frozen concentrate but will either infuse it for a day with a basil chiffonade or may try to make a basil simple syrup to add a touch of sweetness to the mix. And I'm sure I will try this with vodka at some point... Nonetheless, it was the perfect refresher for a sultry summer evening. 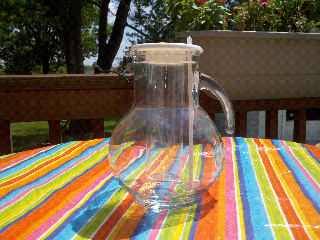 Yesterday's mail brought the much anticipated Italian made glass pitcher just in time for our heatwave. Its mere presence in my humble home has inspired me to embark on a thirst-quenching journey. Every week from now until Labor Day, I will make a different beverage to celebrate summer.